November 7, 2015, Clearwater, FL – Twice before Mifflinburg had been in this position and twice before it had lost. 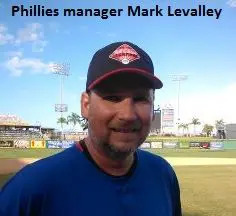 Now, with the game in the balance, Phillies’ manager Mark Levalley had a decision to make. The Delaware Destroyers had just cut a three-run deficit to 4-3 following a controversial play in which officials collaborated to reverse an earlier infield out call that would have ended the top of the seventh inning. With starting pitcher Jim Smith tiring and following a lengthy delay from the umpire meeting, Levalley made the biggest move of the game. Luckily for Mifflinburg, it was also his best. An inning later, Mifflinburg, which finished the week 8-0, secured the title. Brian Ramsey walked and moved to second on Bob Smoker’s single to right. When a pickoff attempt went awry, Smith – pinch running for Ramsey – scored for a 6-3 lead. German Evangelista and Beyer added run-scoring hits to end all doubt about the outcome. Delaware did itself no favors in losing the championship game for the second consecutive year. The Destroyers committed four costly errors and managed only six hits. Still, Delaware, which finished the week 6-2, had a great opportunity to win the title if it could capitalize on the key seventh inning. A leadoff single from Rick Hein was followed two outs later by Brian Freivogel’s run-scoring double down the right field line. Chris Marshall then hit a sinking liner to Beyer at shortstop. Beyer reached to his left and snagged the ball on a short hop, prompting the nearest umpire to rule the play an out on the catch. Beyer however continued with the play and attempted to tag Freivogel at second. When that failed, he made a desperate throw to get Marshall at first. When the ball got away, Freivogel scored. Arguments from the Delaware bench prompted an umpire’s meeting and when the initial out call was reversed, Mifflinburg protested to no avail. Delaware defeated the Puerto Rico Diamondbacks (14-6) before receiving seven strong innings from starter Scott West in a 6-3 semifinal victory over the Long Island Stars to reach the championship game. Mifflinburg parlayed a pair of dominant pitching performances to playoff victories over the Southern Maryland Titans (4-1) and the Central Ohio Reds (13-2). WP: Smith; LP: Hein; S: Toomey. Pitching: Hein and Montgomery (D). Smith, Toomey (7) and Haifley (M). 2B: Chylak (M). 3B: Haifley (M).